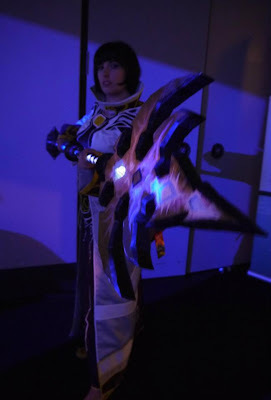 I finished my staff for my Tier 4 Priest costume from Warcraft and debuted it at PAX Prime 2011! Here are some pics of the work in progress. I started with a clear acryllic plastic tube. This is the bottom piece which I made out of Crayola Model Magic, then painted with acryllic paint. I formed the Model Magic around the top of a plastic cranberry juice jug, which fit around the acryllic tube. Oh, I also used purple cellophane wrapping around the tube and then painted black over parts of it. Above the bottom piece is a piece of metal pipe I had lying around. I bought it when I was making a lightsaber a few years ago. It is rougly painted to blend in with the rest of the staff. It gives some balancing weight to the end of it. This next piece was made of purple FIMO then painted with a combination of glow blue paint and white acryllic paint. In the game graphic it looks like it glows so I wanted to give that effect with paint since I wasn't going to build LEDs into it. It turned out when I was carrying the staff around all day at PAX I often rested this piece on my hand to supprt the weight of the staff on my shoulder. Worked as if I'd designed it that way. The large piece here is made of Model Magic, then there is a purple FIMO ring, then a piece of metal pipe. I used thin craft foam inside the pipe in one layer to give it a snug fit against the acryllic tube. Near the top I cut diamond out of the painted cellophane so the light would shine through brighter, like in the graphic. The "head" of the staff is made of blue Styrofoam insulation foam. I bought one big sheet of it, had to have the guys at Lowes cut it in half for me so I could fit it in my car. First I cut the shape out with a hot knife, the sort that has one long thin blade about 4 inches long. Then I sanded it down and shaped the edges with a hotter hot knife, the sort that just has a razor blade on it. Then I gave it one coat of primer (leftover from my furniture-painting projects!) and added on black paint and several layers of purple and white and silver to get the look I wanted. This post is getting long, so I will talk about the electrical madness in another post!